The Rev. Emil Stubenvoll Sr., who was serving eight other communities in the area as a missionary, organized St. John’s Lutheran Church, Leopolis in September 1890. He conducted services for fourteen charter members and their families who helped make up the 60 or so residents of this small logging village. Eighteen months later in March 1892 a small frame church was built by the members and dedicated July 10, 1892. Regular English services were introduced in 1925 and were held on the last Sunday of each month. The Ladies Aid was organized under the direction of the Rev. I. Wagner in January 1916. They were instrumental in the remodeling of the church in 1932, which included putting a full basement under the church, redecorating the interior, the construction of a new altar, pulpit, as well as the construction of an addition to the church. The women communed with the men for the first time in 1936 and in 1940 a Golden Anniversary was celebrated with 90 communicant members. A communion rail was added in 1947 and a new organ dedicated in 1950. The Church celebrated its 100th anniversary in 1990. Adelia Reetz served as church organist for 57 years, retiring in 1989. Following her retirement Brenda Graper and Mary Jung played for services. Jan Tober, a member of Bethlehem Lutheran church, Pella has been serving as the organist since 1978. 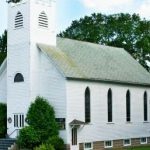 During the early 1900s, St. John’s Church was affiliated with Zion Lutheran Church, Caroline. In 1944, the congregation then belonging to the Ohio Synod applied to the American Lutheran Church for syodical affiliation. In 1961, the church was released from the Zion affiliation and in January 1962, St. John’s Church of Leopolis and Bethlehem Church of Pella formed a two-point Parish served by one pastor. In July 2000, St. John’s Church joined with six other ELCA churches in the area to form a seven-point parish known as The United Lutheran Parish. We are now one of three congregations served by Lois Graper, along with three lay ministers. Today the congregation though small in number, continues to faithfully work together serving the Lord. Following the example set by our namesake the Apostle John, the mission of St. John’s Lutheran Church, Leopolis, is to encourage the Word of God to soar like an eagle. That mission includes providing a safe and holy sanctuary where people can worship and pray, a place to hear the true Word of God, and receive the Holy Sacraments. The Church’s mission is also to share the Good News of Jesus Christ’s birth, death and resurrection with other brothers and sisters, whether they are members of this church or not, as well as being the Good Samaritan to anyone who is in need. ~Holy Communion is celebrated on the 1st Sunday of the month.